Scuba diving is great fun; a time for expanding horizons, making friends and taking on new challenges. But divers, and especially new ones, can experience dive anxiety at times. Thankfully, dive anxiety can be managed, and even overcome, in time. There are many techniques to make it a thing of the past. Here are our tips for overcoming anxiety as a scuba diver. Controlled breathing helps keep a diver from entering a psychological state of anxiety and panic during a stressful situation. Being in a state of panic can lead to dangerous situations for divers and poor decision making in emergencies. Thankfully there are many breathing techniques available to help reduce anxiety, calm the mind, and prevent the onset of panic. All of those benefits can be useful when dealing with irrational fears, understanding, and working through them. It is easy to practice at home, doesn’t require a huge time commitment, and can help divers understand the underlying cause of their fears. Mindfulness is particularly helpful for recognising when a diver begins to show a stress response to different dive triggers. Skills practice is essential for all divers and not just those new to scuba diving. Regular practice is a great way to manage dive anxiety throughout a diver’s life and is something often overlooked when divers become experienced and think it no longer applies to them. Complacency can kick in and that is when old fears can resurface without warning. A diver who has tackled fear should occasionally keep practising the skills that caused fear in the first place and keep exposing themselves to situations that broaden their dive skills and knowledge. With experience, the mind is taught to relax and continues to learn that there is nothing to be afraid of in different situations. The body also learns muscle memory for skills that, in the case of panic, it can handle safely without the mind’s clarity. Visualisation is a technique used by professionals all over the world to achieve their goals. It can be used effectively to teach the brain how to respond calmly to something it perceives as a threat, and can be done without professional assistance. It is a simple technique that allows the mind to learn new skills and create success by imagining or ‘visualising’ what the person wishes to achieve. It is best to practice visualisation whilst feeling relaxed, such as when resting, meditating, or even whilst exercising. 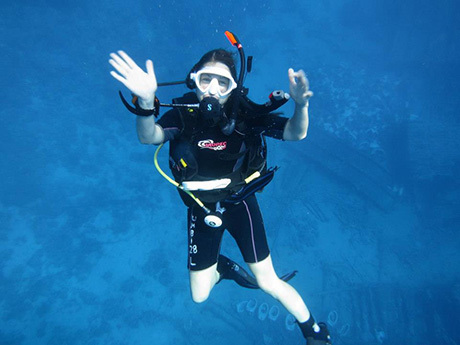 An example in scuba diving would be overcoming a fear of breathing underwater when beginning a dive. To overcome that fear, a diver would visualise each step of descending in the water and breathing whilst remaining calm. The visualisation would be built up slowly, always ending at a point before the diver feels the first signs of stress during the visualisation. Over time, and with repetitions of the visualisation, the diver’s mind learns there is nothing to fear and a stress response is no longer triggered. Hypnotherapy is an effective tool for reducing anxiety and it retrains the brain to remain relaxed when it perceives there is a threat. It lends itself well to scuba diving and reducing anxiety associated with specific situations, such as taking a mask off underwater when it triggers panic. Patients are fully aware during hypnotherapy and there are many practitioners available today for in-person and distance sessions. Undertaking hypnotherapy sessions prior to learning to scuba dive is a great way for divers to understand their fears and learn relaxation techniques to prevent panic when diving. Overcoming dive anxiety does take time and patience but it can be done. Making diving as easy and enjoyable as possible in the meantime is important. Divers should consider choosing appropriate dives that are less likely to trigger anxiety, so they can enjoy getting in the water whilst they learn to overcome their fears. Examples can include diving locations with warm and calm water, such as scuba diving in Turks and Caicos, diving shallow sites with good visibility, and even diving one-to-one with an instructor to improve confidence. This article was written by divers and writers at liveaboard.com.